The exceptional Punch Quest wasn't the only extremely macho iOS action game released on the App Store in the past few days. In fact, it arrived alongside a new title from GlitchSoft (Destructopus) and Chillingo that stars one of pop culture's most muscle-bound animated icons: He-Man. The bare-chested Eternian is the star of his very own classic 2D hack-n-slash romp, He-Man: The Most Powerful Game in the Universe, and it must be said that the game isn't just a treat for fans of the seminal 1980s Filmation cartoon -- anyone who enjoys a good arcade-style experience on their iPhone or iPad is in for a great time. Costing US$0.99 and featuring in-app purchases which thankfully don't hamper the experience, this universal game uses a intuitive -- if a tad sluggish -- gesture-based control scheme for controlling the mighty He-Man though 27 levels of lavishly hand-drawn scenery. 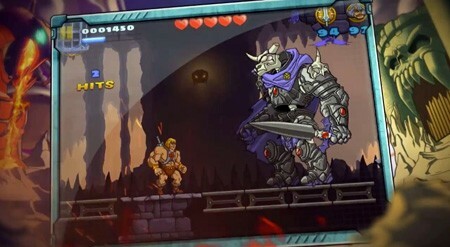 The game looks especially vivid on Retina devices, but its personality-packed lead character, his friends, and his foes still pop on the iPad 2 and earlier devices. It's not the most challenging game, but the mixture of running, jumping, slashing, and learning new special moves that it provides is still a ton of fun, especially if you've gotten a kick out of games like God of Blades. You don't have to know anything about the source material to enjoy it, but if you're a child of the '80s -- particularly a fan of the show -- you're going to be blown away by the amount of fan service on hand. Just check out the video below for a taste of what to expect from He-Man, Skeletor, Orko, and the rest.